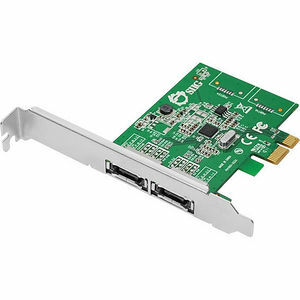 SIIG's DP eSATA 6Gb/s 2-Port PCIe is a high performance eSATA host adapter designed to add two external SATA (eSATA) 6Gb/s channels to your PCIe-equipped computer for additional hard disk drive connections. It supports SATA hard disk drives up to 4TB, ATA/ATAPI-7 specification as well as port multiplier. This dual-profile host adapter can be installed in standard height or low profile chassis with the included bracket. It is the ideal solution to enable fast, large volume data transferring for your bandwidth-hungry applications.